The most important thing that I learned while I was a volunteer was that God was with me every day, in everything I did, even the small things. The most important thing that I learned while I was a volunteer was that God was with me every day, in everything I did, even the small things. I served as the Assistant Girls’ Dean at Maxwell Adventist Academy near Nairobi, Kenya for ten months. I ended up in Africa because I’d always wanted to be an Assistant Dean and it had always been my dream to see a cheetah (my favorite animal) in the wild. 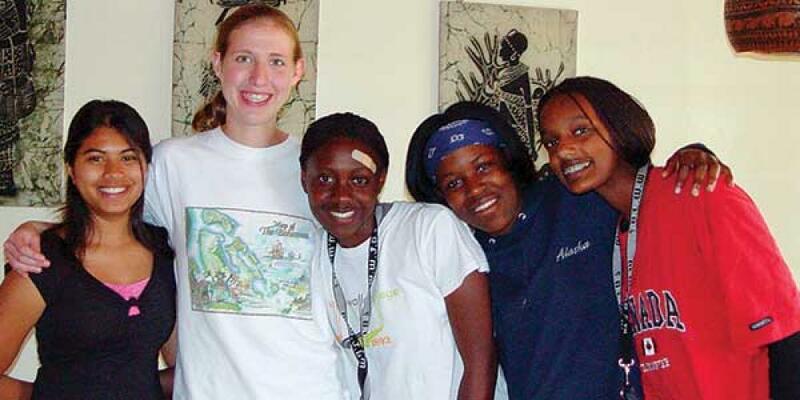 When I heard about an Adventist academy in Kenya, I knew it was where God wanted me to be. My adventure began on the way there. I was terrified of flying by myself. I had never really flown before, especially internationally. I was afraid of missing my flight and ending up stranded in another country. God answered this prayer before I even knew what to ask for when I heard that another student from my school would be going there the same year, so we were able to fly together. When we arrived in London, we were given five pound (British) food vouchers and told that there would be no food on our eight-hour flight to Nairobi. I had no idea what five pounds would buy and because of the time difference I wasn’t very hungry. I ended up buying candy and water. On our flight, they only gave us water. This irritated us because we had paid so much for our plane tickets. However, when we arrived at the school and learned that we had been one of the last flights out when the British Air Strike stranded 70,000 people in Heathrow, we realized that God had once again answered a prayer that we hadn’t known to ask. When I arrived in Kenya, I was informed that the Head Dean had not arrived yet. I was told not to worry and that she would be there in six to eight weeks. They really meant six to eight months, because I arrived in August and she came at the end of March! The Head Dean was supposed to be the nurse, and for the first three quarters, I had to be that for my fifty girls living in the dorm. I am not a nurse, but with God’s help, I did the best that I could. Most of the time, I told the girls to drink more water and to go back to bed. And thankfully, most of the time, that was enough. God helped me get through the day-to-day struggles of being a dean. I survived the morning that I woke up to a phone call informing me that there was a snake in the dorm. I survived the morning when two girls locked themselves in their room. I counseled girls when they had major crises, such as being homesick or liking the same boy. The great thing about working with teens is that I never knew what to expect, but I knew that God would give me the wisdom to deal with each situation as it came. Being away from my family and support system for such a long time was tough. My grandfather died and I got really homesick. But God was always with me and showed me in many ways that He cared about me. He even gave me the best Christmas present ever; on Christmas Day I saw three cheetahs in the wild! Near the end of the year, I was able to go on a band trip with some of the students. We accidentally drove through a riot in Nakuru, where the townspeople were protesting the death of a native at the hands of a white person. The people were burning tires and they started hitting our bus with branches as we drove by. They were also yelling things in Swahili, which our Kenyan students translated. The people angrily asked our students why they were riding with the “white murderers.” They could have stopped any of the vehicles in our caravan and harmed the students, but as we prayed, God sent us protection from the angry mob. God also protected me when I did stupid things like getting out of the car in the game park to check out an ostrich nest (I didn’t see any lions)! He protected us when we tempted a rhino to charge us, or when we were chased by an elephant in musk! There were many other times where God protected me in my daily activities throughout my year in Kenya, some that I recognized, and some that I will learn about from my guardian angel when I get to Heaven. But the most important thing is that I now have no doubt in my mind that God loves me and is with me in every aspect of my life. There was a severe drought the year that I was at Maxwell, and I had the privilege of going on several relief trips to take food and water to the Maasai. * Many people donated money to the school and we were able to help over 6,000 people with our frequent trips. It was eye-opening to see the needs of these people and it was very rewarding to help, if only a little bit. I don’t know how much of a difference I made in the lives of my girls in the dorm. I hope I showed them how much I cared about them and that I made a difference in some small way. They were each like children to me and I am blessed to still be in touch with some of them. I do know that my year as a volunteer changed my life. It was a challenging year, but with God’s help I made it through, and I’ve become a stronger person. It was very difficult to leave at the end of the year because I knew that I wouldn’t see most of my girls on this earth again. But I look forward to seeing them all in Heaven. Reaching just one person for God and then seeing the people you’ve reached again in Heaven will make being a volunteer worth all the sacrifices in the world! *The Maasai, an ethnic group located in Kenya and northern Tanzania, are best known for their distinctive customs, dress, and residence near many game parks of East Africa. Valerie Robinette, originally from the United States, served as an Assistant Dean of Girls at Maxwell Adventist Academy in Kenya. She served from August of 2005 to June of 2006.